Vintage Murano Glass, Handmade, Flowers and Leaves with Copper wire stems. These are old, handmade Murano glass items. We originally sold some flowers and leaves when we started in 1976; and "dug" these out of the back, dusty rooms on our recent trips, to Venice, and Murano, Italy. These are from several Italian sources, and therefore, some will have thinner copper wires, and some will have thicker copper wires. The colors of the hand made glass flowers and leaves will be the same colors as in the photos. Supplies are limited. Because these are a rare find; very time consuming to pull each flower or leaf from inventory; and are priced so inexpensively; you can understand why there are no returns on any of the Vintage Murano Glass Flowers and Leaves. 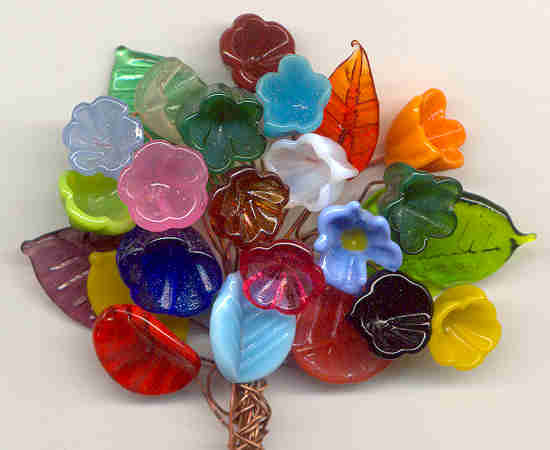 Click on Sub-Categories below, to view the beautiful, Vintage Murano Glass Flowers and Leaves.